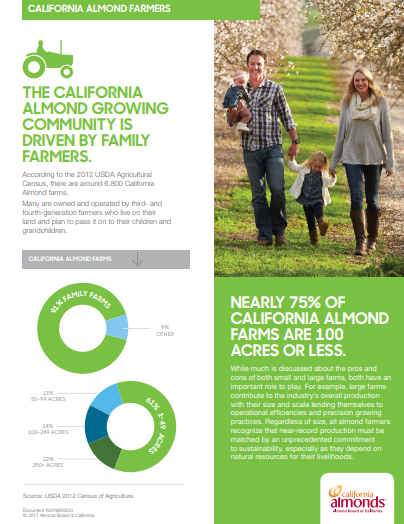 The California Almond community is driven by family farmers and processors. According to the most recent USDA Agricultural Census, there are around 6,800 California Almond farms. 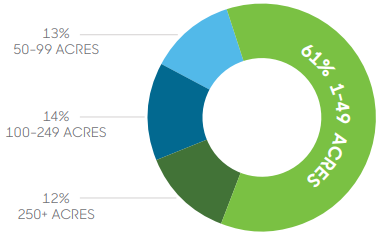 Over 90% of these are family farms, many owned and operated by third- and fourth-generation farmers who live on the land and plan to pass it down to their children and grandchildren.1 Furthermore, there are 101 almond processors, and many of them are also family-owned and operated. The almond community recognises the need to manage resources for current and future generations carefully and offer continued work for its employees while protecting its families, neighbors, local communities and the environment. Nearly 75% of California Almond farms are 100 acres or less,2 but small or large, California’s almond farmers take a long-term view of success based on respect for the land and local communities. Regardless of size, all almond farmers recognise that growth must be matched by an unprecedented commitment to environmental responsibility, especially as they depend on natural resources for their livelihoods and the livelihoods of their families and surrounding communities. 1. United States Department of Agriculture. 2012 Agricultural Census. 2. United States Department of Agriculture. 2012 Agricultural Census.